It has taken me an incredibly long time to get round to reviewing this particular book. 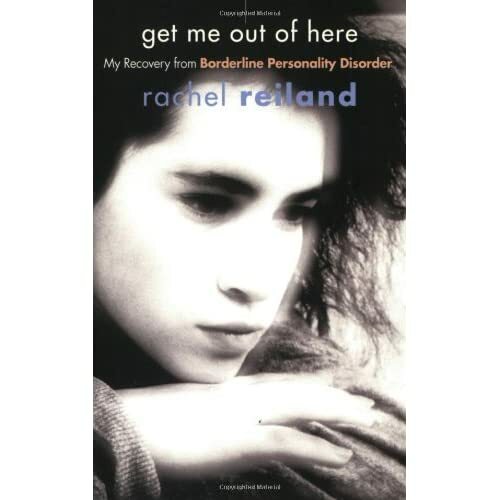 Rachel Reiland’s Get Me Out Of Here (published by Hazelden) is a very challenging read. And, at 447 pages, it is a lengthy challenge. Rachel seemingly leads us through every minute and nuanced detail of her arduous recovery from (what is still commonly referred to as) borderline personality disorder (BPD). It appears that she spares the reader very little, hence a page-count which invites especially committed participation in a very unsettling story. By way of a brief introduction I will attempt to sketch out the basics of borderline personality disorder. Among the many symptoms associated with BDP are: fear of being abandoned, unstable and intense personal relationships, impulsive and sometimes reckless behaviour, suicidal behaviour, kneejerk changes in mood, and problems in controlling anger. There has been a definite stigma associated with BDP within health care services (with sufferers seen as ‘difficult’ or ‘attention seeking’, etc., due to their ‘faulty’ personalities). This is one of the reasons why there are currently moves to rename the condition; suggested alternative descriptions include ‘emotional dysregulation disorder’ and ‘post traumatic personality disorganisation’ (derived from the assumption that past trauma, especially in childhood, has caused the condition). Reiland’s book, however, does not deal with the controversies associated with the BDP diagnosis. A particular aspect of this book that does not sit comfortably with me is the way Rachel Reiland (not actually her real name) is so gushing in her praise of the health care services which assist in her recovery. She particularly singles out her therapist, Dr Padgett (presumably not his real name either), for almost unconditional acclaim. It would certainly appear that the services and practitioners are indeed deserving of credit – they have, after all, helped Rachel to overcome a seriously limiting condition and enabled her to live a much fuller life (in terms of both family and professional career). But it also seems to me that there are ways in which the care provided is less than helpful. Rachel’s periods as an in-patient in a psychiatric unit are especially unsettling. It is, in fact, a relatively common-place situation that leads to her initial admission: she succumbs to the stress of keeping house and caring for her demanding young children – essentially, she ‘loses it’. But the unit is hardly an understanding and compassionate environment. At one point, to relieve the boredom, Rachel ‘power walks’ around the unit while listening to her Walkman. A charge nurse, however, puts a stop to this, confiscating the Walkman and telling Rachel that she obviously can’t control herself. A second ‘power walking’ incident leads to Rachel being held in isolation in the ‘lockup’. The bulk of the book, however, focuses on the out-patient therapeutic relationship between Rachel and Dr Padgett. Padgett (the Medical Director of Psychiatry at the unit) offers Rachel very frequent psychoanalytic therapy sessions over a considerable period. Rachel exhibits alternating attitudes to Padgett; one minute she idolises him, and the next she loathes him (this is portrayed as classic BDP behaviour). But from the very start she appears to be unhealthily dependent on him, and he almost seems to encourage this dependence – not that she ever criticises him for that. As a reader involved in the unfolding story, I found myself increasingly ambivalent about Padgett. On the one hand, he is the key figure in Rachel’s recovery, the one who makes it all possible. But on the other, he comes over as the one calling the shots in an extremely unequal relationship. And, as this is in the context of American private health care, Rachel is paying to be the lesser participant in this situation. It seems to me that Padgett enables Rachel’s recovery, not by working in partnership with her, but by demanding that she yield to his will and superior status. On the occasions when Rachel becomes angry and unco-operative with Padgett, she appears to be quite right to react this way (though the scale of her reaction is usually excessive). Get Me Out Of Here is, of course, a positive book. The fact is, Rachel recovers, and in doing so she offers hope to other sufferers of the same condition. I can’t help wondering, however, if she would have recovered just as well – if not better – if she’d had a therapist using a different and more collaborative approach. Rachel, however, is perfectly satisfied with the approach taken by Dr Padgett, and she, after all, is the one best placed to judge.